Have you ever seen Se7en, Saving Private Ryan, or Batman Begins? Do you know the similarity of these films? Maybe not everyone knows that these three films using the same technique commonly called Bleach bypass. From wikipedia Bleach bypass, also known as skip bleach or silver retention, is an optical effect which entails either the partial or complete skipping of the bleaching function during the processing of a color film. By doing this, the silver is retained in the emulsion along with the color dyes. The result is a black and white image over a color image. The images usually would have reduced saturation and exposure latitude, along with increased contrast and graininess. 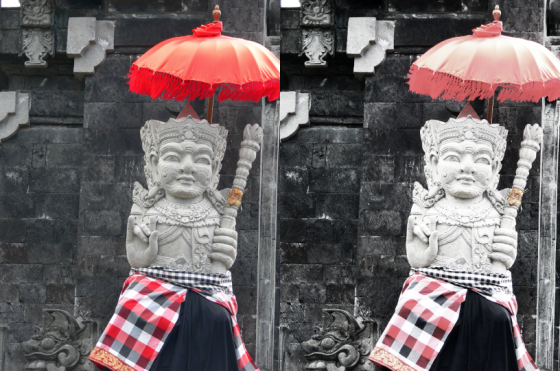 It usually is used to maximal effect in conjunction with a one-stop underexposure. Use this adjustment layer to desaturate. Mine is -55. 5. Our image seems pretty dark, and needs brightness. So, we are going to enlighten the image with Curves.